As detailed in my earlier post about exception signatures I and my colleagues take exceptions from our production servers seriously. In addition to grouping them by signatures (which helps a lot and makes triage much more pleasant) and logging them in our internal bug tracking software we also try to add relevant debug information whenever we throw an exception. The BCL team in their infinite wisdom added the Exception.Data property. This property is simply an IDictionary which allows storing key and value pairs of any type. By default this is an empty collection which means you don’t have to worry about it being null. When the exception reaches our internal trac site it might look something like the image below (in our case the data dictionary will actually be added as a comment but you get the point). This has proven to be is incredibly useful for debugging purposes but it is a bit tedious to actually write the code. Storing the exception in a variable just to get access to the data property just didn’t feel right to me and writing the same boilerplate .Data[“xyz”] = xyz was just boring. Step 1 – The AddData extension method. It might not look like much but it sure helps when you want to add debug data to an already existing exception, it saves you from having to store the reference and so on but it still doesn’t solve the problem with having to write the argument names twice. This isn’t only a nuisance when writing the code; it’s very easy for the key and value to get out of sync if you’re doing refactoring since refactoring tools will only change the variable name, not the key. And have the AddData method automatically infer the proper key name but since that’s not possible I had to find another way. We continued using the AddData extension method above for a couple of weeks before it dawned on me that I could use anonymous types to skip the parameter name duplication. Anonymous types have the great ability of being able to “infer” property names when initialized. With this in mind I wrote an AddData extension method which accepts a single object and then uses reflection to iterate over all properties and adds their property names and values into the exception data dictionary. This allowed me to rewrite my code yet again. Neat, isn’t it? This is the exact same technique that ASP.NET MVC uses for route-declarations, attributes in html helpers and more. Not like in the olden days. It comes with a cost but you shouldn’t be too worried since you’re probably not throwing exception often enough for it to matter anyway (and if you are, then you have bigger problems). /// Extension methods related to instances of System.Exception and inherited objects. /// the exception allowing chaining. /// The key of the debug value to be inserted into the exceptions data dictionary. /// The value to be inserted into the exceptions data dictionary. /// An object from where properties will be read and added to the exception debug data collection. // of throwing exceptions so unless we're in debug more we'll just silently ignore it. At work we use the excellent lighttpd (or lighty) web server as a frontend reverse proxy that performs SSL offloading, and some other neat tricks before our visitors reach our backend servers. It’s been working like a charm. We’ve been using mod_status to keep track of how much traffic goes through our frontend server. mod_status is one of those little apps that gets the job done but not so much more. It contains all the relevant information but I wanted to display this data on a separate monitor to as a way to keep track of how much traffic we where getting in real time. Since it’s a static html page there wasn’t much interactivity there. So I whipped out my vim-editor and wrote a little helper page that dynamically polls data from the server-status page and displays it in a little more full-screen friendly way. You can see the result below (click on it to enlarge). It will automatically refresh the data once every 5 seconds. Then you simply put the file in that page and it should just magically work. Note that the file loads the Google hosted jQuery library so if you don’t have access to the internet (on the machine your viewing from) you’ll have to download the jQuery script and place it along side the page. Things on the todo list include pretty error messages when the data can’t be fetched and perhaps a nice little demo-mode. Intellisense is one of those killer-features of Visual Studio. I love that I can just drop in an assembly in VS and start poking around in an editor to get a feel of the API. If the API i properly documented and layed out in a .netty way I can immediately start working with it. The flipside of intellisense is that once you get used to it you feel severely limited when you encounter a project without intellisense. That's what happened to me today. I was integrating the excellent Google Maps library into one of our websites and decided that I should use the latest and greatest release - Google Maps v3. I fired up VS and started hacking away in a .js file until i got flashbacks from back in the days when I developed PHP. I was toggling between writing code in my IDE and reading the api documentation in my browser. It was horrifying! At some point I realized that since I can get intellisense for jQuery I should be able to get it for Google Maps as well so I started googling and found this single commit project at codeplex that did offer an intellisense file for Google Maps v2 but not for v3. That's when I started looking at writing my own intellisense file. I tried to validate the Google API reference in the W3 Validator only to find out that the king of all web doesn't always produce the best markup. Not to fear; I've written a couple of screen scraping utilities before and I know that there's one project that makes dealing with badly formatted html a breeze: Html Agility Pack. The agility pack parses almost any amount of bad markup and gives you a nice little XPath interface for poking around inside the DOM. After some hackish (screen scrapers are always messy) code I was able to produce a basic intellisense file that covers most of the Google Maps API. The js intellisense file and usage instructions can be found over at http://www.freakcode.com/projects/google-maps-v3-vsdoc. At work we develop, maintain and host a web solution which consists of a fair amount of assemblies and spans across several websites. Although we might like to think that we develop perfect code that certainly isn't always the case. And as with all non-djb applications ours sometimes generates a few exceptions. Now please don't think of us as bad people, exceptions are an unfortunate part of nature and not all exceptions are the result of our bad programming, quite often we get exceptions from external libraries, from asp.net (viewstate exceptions, forbidden input exceptions and so on). Quite early on in our development process we decided that we needed a way of reacting to these exceptions as they happened. Our solution was to implement global exception handlers which sent an email to us whenever an unhandled exception occurred. This worked great and in our early days it was more than enough. We could immediately react to an exception and we could often deploy a fix rapidly. If you don't keep track of your exception at all you're probably in trouble. See this post by Jeff Atwood for a better explanation of why than I could ever come up with. When our sites had been live for a while and started to get some serious use we noticed that it was getting really hard to keep track of all incoming exception mails. From looking at the stack trace we had no idea if an exception had been resolved, if someone was working on it, it's priority and so on. Troubled by the need to keep a bunch of stack traces in (my) memory I started thinking about ways of solving the problem. My idea was to convert the exceptions into issue tickets. We use Trac at work so I started looking at simply redirecting all of our exception email there. Getting the exception mails converted to tickets wasn't really a problem but it didn't help at all with organization since every exception spawned a new ticket and we still had to manually merge the duplicates. In order to enable organization I started looking at generating a fingerprint for every exception. Some sort of string generated by looking at the stack traces of the exception, its inner exceptions and meta information of each exception. I wanted a solution which could be intelligent enough to differentiate between two exceptions thrown from the same place but for different reasons (i.e., the algorithm should look at the entire exception chain instead of only the base exception target site). In order to handle these cases I made the algorithm aware of three "pretty standard" ways of including dynamic data in exception messages. Text within single and double quotes. Invalid state for refund "inprogress"
I also wanted localized exceptions to produce the same signature when possible. We have a windows app used by some of our customers and we wanted exceptions from them to produce the same signature regardless of their OS language. To accommodate this I added some custom code for exceptions which contain an ErrorCode (SocketException and Win32Exception) and use that instead of the message. My last requirement was that the signatures generated would be short so that we could display them to our users when they encounter one of our error-pages. This enables our customer service to provide status updates to calling customers by simply looking up the signature in trac and looking at its status. As such the signatures are no-crazy-signs 8 character hex strings, like "617c1de5" and "1570d6d7"
I think I've covered all my requirements and I must say that it has worked great for us. All of our exceptions end up in trac where we can prioritize, assign and catalogue them. We even have a great way of knowing when exceptions that we think we've squashed re-appear because then the ticket just get re-opened. I have not used ELMAH personally but I've certainly heard many great things about it. From what I've read about ELMAH it seems that they have some great features for filtering unwanted exceptions but I haven't seen anything about grouping exceptions. The ideal thing would of course be if existing frameworks like ELMAH used this implementation to provide simple grouping. This is an example of how it looks when we encounter an exception in our system. Note that although the exception was thrown twice there’s only one ticket. This is the part which makes my stomach ache... The code, complete with a couple of unit tests and an example program plus more information is available at http://www.freakcode.com/projects/exception-signatures. 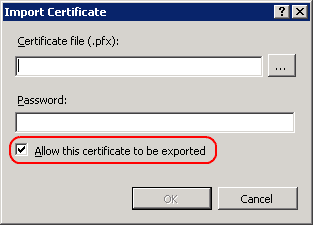 After a lot of debugging/googling I managed to find a solution; you have to check the "Allow this certificate to be exported" box when you import the cert. Really strange and really not good practice but until I find another solution that's the way it has to be. If you've got another solution please comment!